Hello! 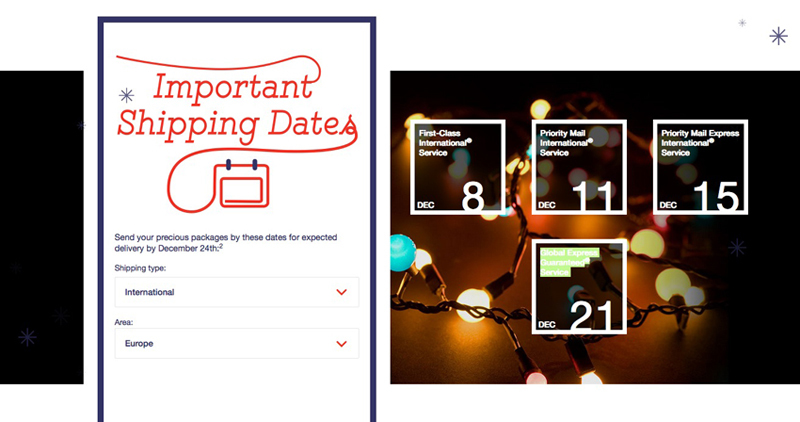 Here’s a handy list of important USPS dates for Holiday Shipping, around the world. Please note that these dates are the *recommended* ship-by dates from the USPS and only the Express Shipping options can be guaranteed by both the USPS and your favorite online retailers. We always do our best to ensure that Holiday packages get into the mail stream ASAP for you! We love playing the part of Santa’s Elves this time of year 🙂 So if you have any special deadlines or requests, let us know! We’re happy to ship right to your friends & family and love to include gift notes too. This entry was posted in Found & Shared and tagged 2015 holiday shipping dates, holiay cutoff dates, holiday shipping dates, important shipping dates, usps by allison. Bookmark the permalink.